Is this marble or engineered stone? What's the price difference in a waterfall edge and anything else ie ogee bullnose or beveled? PLEASE share the name of cabinet manufacturer and hardware. What is the material for the beveled tiles? - Is it the same as the marble slab? How deep/thick are your benchtops? Who makes the hanging lights? Lana - Where are the chandeliers from? Thanks! I love the entire kitchen--beautiful, soft and lovely. What is wall color? Sorry about that ....try this link. What are the best tips for matching a calacatta countertop to calacatta subway tiles. How do I find a close match without spending a fortune at the marble yard? are the countertops granite or marble? This is Calacatta Marble with a waterfall edge on the left side of the island. Cabinets - Love upper and lower...info please? You mentioned this is a pettite kitchen. Please tell me the footage of the kitchen. Hood manufacturer and model - Love the hood, can you please indicate who's the manufacturer and what's the model of the hood. Thanks! That hood is by Bertazzoni. How long is the island? I would really love to know as well. I would so appreciate knowing, as well. Yes, I would like to know the color of the walls too. Thanks. I have one very similar, if not exactly the same, from o.co. The picture on their website makes the shade look white, but in real life, it's a wire frame wrapped with string in a creamy off-white. I like mine a lot, and it's reasonably priced. is the counter top durable/heavy duty? does it stain easily, I love the look but worried about the maintanence..
Is this countertop calacutta nuvo ceasarstone ? What is the make & model of the stove/oven? Dimensions? Backsplash Tile Size - Is this 6 x 12 backsplash tiles? Paint color - What paint colors is the trim and wall? Range hood - Hello, can you tell me what brand the range hood is? Many thanks! Is this the Brittannica By Cambria? - It looks little different then the other photos you have of the Brittannica but may be just the way it was cut or the lighting. What are the back splash tiles? Love them! - Backsplash tiles?? Love the cabinet pulls! - Would you mind sharing the name of the cabinet pull manufacturer please. Lovely kitchen! - Can you please tell me the dimension of the island? Thank you! bar stools - hi Beautiful kitchen! could you pls tell me where the bar stools are from and approximate cost? Many thanks. what are the suggested color of exterior house paints? tell me about the hanging lights?? are they covered in shades? What does the space measure between the stove and the island? love the cabinet hardware, who is manufacturer? Lighting over the island is a must. If your island is finished in marble, consider accessorizing it with gold fixtures. Look for something out of the norm — traditional chandeliers get a quick update when placed inside modern drum shades. This petite, light-filled brownstone kitchen in Boston almost has a feminine feel, with its silvery Bertazzoni range hood and its filmy pendant drum shades. 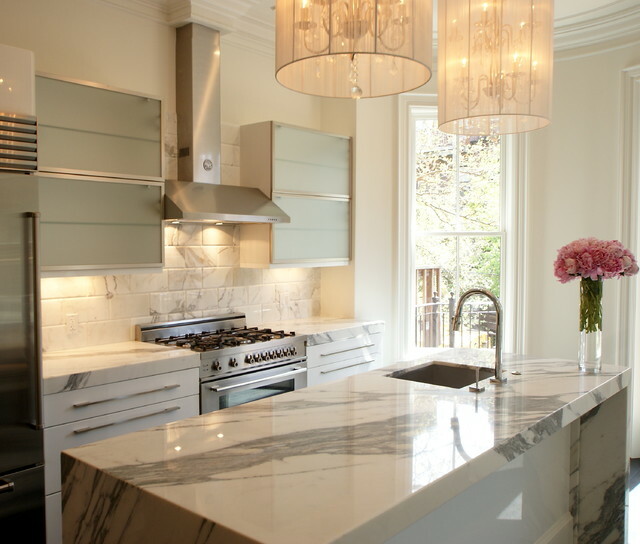 White Calacatta marble wraps around the island and is used on the counters, while Calacatta subway tiles adorn the backsplash. Floor-to-ceiling windows flood the space with sunlight.Carrara vs. Calacatta: What’s the Difference?